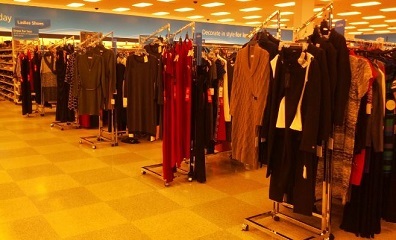 If you haven’t been to a Ross Dress For Less location lately, Ross wants to show you some of their new looks! Visit the Ross Facebook page to vote for your favorite fall blogger look! Each week they’ll be sharing a different look and you’ll be able to vote up to once per day for your chance to win. Each week they’ll randomly select two $150 gift card winners who will have the chance to shop for fall essentials at Ross! Be sure to visit to both get an idea of what’s going on at Ross (and what fantastic styles you can find – I ALWAYS find something when I go there!) and enter to win a prize! Who can’t use a little shopping spree?? And with $150 at Ross, you can buy a TON of stuff! To get everyone excited about the new Ross locations, I am giving one lucky winner a $25 Ross Dress For Less Gift Card! To enter this giveaway, complete any or all of the options listed below. Giveaway ends 9/24. Good luck! I would shop for clothes or shoes for my daughter. I love Ross’s! Great fashion for amazing value for the whole family! I ♥ ROSS shop them every time I come across one and now im so excited one is opening up in my town.. its like hitting the jackpot woot woot.. only thing that could make it better would be winning a gift certificate to shop on… wink wink. I would love a new hoodie/ sweater / or sweatshirt, thank you so much for the giveaway! I love Ross I alwaya find something fabulous for me! I want to win, it is as simple as that. I would buy some new flat shoes I am so done with heels! I haven’t been there in a while but they have some nice clothes and other things like shoes that would be fun to shop for. Clothes for my tween daughter. I would shop for a new pair of jeans. I have six kids so we are always needing something! I would shop for a dress. I would shop for new t shirts. I would shop for sweaters. I like to shop for colorful shirts at Ross! They have so many to choose from. definitely a fall must have! Sweater! I would buy a dress or shoes for my brother’s wedding coming up. I would love to look at their home decor, and maybe get some new artwork. I would shop for dressy shirts. I hope to start a new job soon. I like this store!! I would shop for some new dresses for me! i love looking for tops there! I’d shop for a new handbag! I’d shop for work clothes for me. I need an update to my work wardrobe. I would look for some Fall clothes. I need a light weight coat. Thanks for the chance! A new dress for fall! My kids and grandkids could definately use it! I would shop for clothes for my son since his birthday is this Halloween. Clothes! Maybe for winter clothes. I would like to get a hat and a new scarf. I’d look for a new purse because mine is starting to fall apart. I love clothes shopping…for my 4-year-old nephews, my parents, or myself! I’m looking for some cute maternity dresses! A new dress for me. I would like to get some cute new tops. I would love to find a casual dress. Probably clothes – I need some pretty new tops. Love this store! Great pricing on housewares too! I would get boots for my daughter! I would shop for shoes. I plan to buy some cute dress for my niece who is 5 years old.. I would get myself a new jacket for fall! I’d shop for baby items and pet supplies. I would treat myself to a new purse. I would shop for some new blouses for work. sweatpants for me and sock/shoes for my baby daughter! I would shop for a sweater and jeans. I’d use it to start Christmas shopping! I would shop for a new set of pots and pans if I won! I’d like to shop for some skirts.